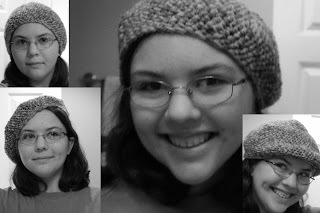 I once heard something about wire crocheting- apparently you can make some really cool things with it. 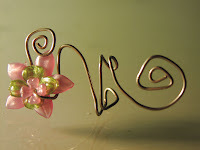 So me being me (and I love to experiment) I pulled out my smallest yarn crochet needle and some floral wire. END RESULT: My fingers were very sore. My poor needle was dying a slow and painful death from erosion. And I had only finished two rows. I don't think I'm ever going to try that again. One thing about tiny towns is that you can't find craft supplies... you are therefore forced to make your own. Case in point: S hooks. These are perfect for all your jewelry. They can easily be clasped with one hand (think bracelets) and aren't a pain to attach (think lobster claw clasps). Use with jump rings. More pictures of stuff I made! A butterfly neecklace and an Elvish hair clip. This is the butterfly necklace. I used floral wire and seed beads to make the butterfly. I used these instructions to make the beaded chains that attach the butterfly to the colored hemp cord. For a clasp I made my own jump ring and S hook. 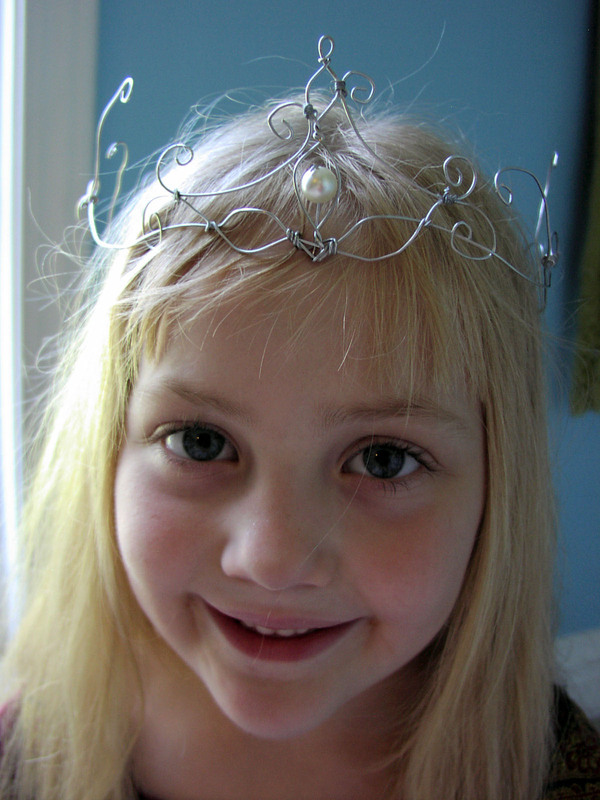 The hair clip! 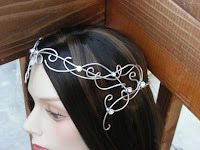 Perfect to go with an Elvish or fairy costume! Now, if only I had one of those... :) The leaves are Czeck glass. Basically I just took some 20 ga and floral wire, twisted some beads in it, and tied it onto the clip. Hooray!!! I have some new materials!!! Thanks to small towns like ours, it can be very difficult to find beads and wire... A friend suggested I look online, so I spent some of my birthday money on the most beautiful beads and a ton of wire. I've wanted some leaf-shaped beads for making Elvish jewelry. After some reasearching, I discovered these awesome Czech glass beads. They are a bit pricey but very good quality. And pretty. Most sites have a pack of 24 for $4. I found a site called BrightlingsBeads selling them for $2. They have free shipping (no minimum order!) and had a great Labor Day sale. For the wire, Mom found a website called Our Lady's Rosary Makers (OLRM). We also got a pair of round-needle- nose rosary making pliers from them. Ben fell in love with it and has already finished half a rosary! What a boring title. Rings. Well, this is all about rings, and only rings. :) Hence the unimaginative title. The first two are the same design with different beads, the third is on of a myriad "okay" designs. 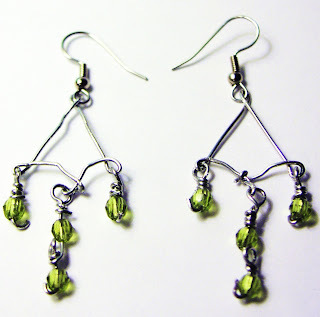 The design of this particular one allows you to wear earrings, too. Here are more backgrounds (or rather, several variations on the same one) that anyone can use. Look at my earlier post to see how to use these. Guess what I've recently fallen in love with? Crocheting. 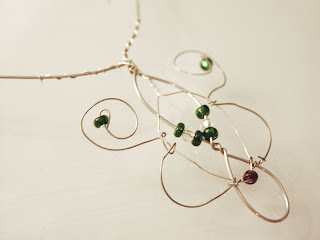 Imported from my old blog... first attempts at Elvish jewelry! 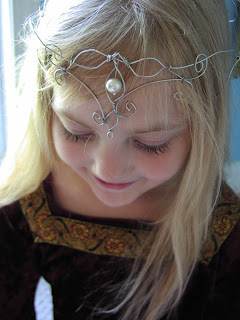 EDIT: I've since made many, many more Elvish jewelries! 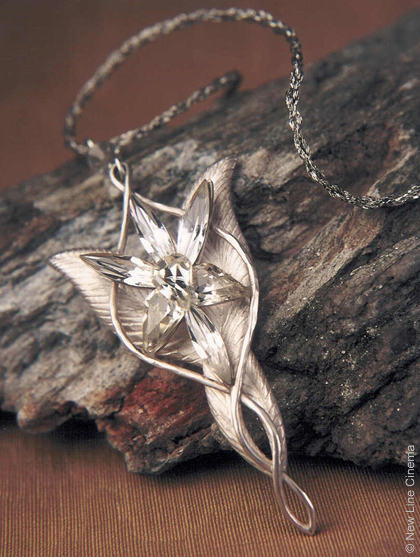 In fact, almost half the jewelry featured on this blog are Elvish. Since it is virtually impossible to find anything like this in Rolla, and even if you did, it would probably be very expensive, I decided I would try to make some for myself. I HATE WAL-MART. Let me say that again: I HATE WAL-MART. They took away 3/4 of their fabric, but their worst transgression is the fact that they have deprived their art section of anything of worth. Once upon a time you could find beads and wire, embroderiy floss, random craft sets, paints of all kinds, etc. Now all you can find are: premade bead necklaces, some scrapbook supplies, cheap kids crafts sets, and wedding decorations. I HATE WAL-MART. To get to my point: There are no other craft supply/hobby stores in Rolla that I know of. (Unless you count that moldy one downtown). 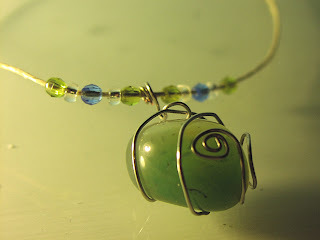 I had to deal with a small Ziplock baggie of leftover beads from old projects and thin floral wire. At a garage sale I found a small spool of thicker wire, but I already use it up in these projects... Dad had a pair of needlenose pliars that are really helpful. I was actually fairly proud of this next creation. 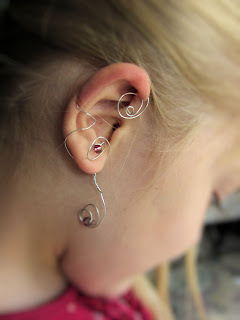 I'm calling it an ear cuff. Sounds funny, I know, but what else should I call it? 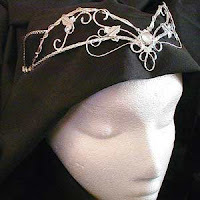 I think you would probably only wear one of these, and you can wear earrings with it, too. Not so much a shoppe as a place to display my wares. A nook to cram myriad crafts in. A whole world of creativity. A land overloaded with too many explanations. A waterfall of artwork. However thou dost choose to veiw it. Why Faerie? I am fascinated with fantasy, myths, and medieval times. Most of my artwork and crafts are heavily influenced by fantasy movies, fairy tales, and the works of such genius as Tolkien, Shakespeare, and Lewis. 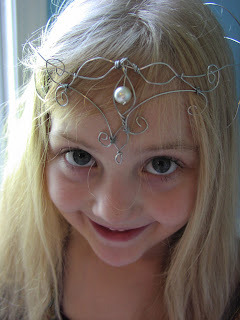 Besides, my first name means "Fairy of the deep pond" (a recent discovery that I am rather proud of). Today and on the morrow I shall attempeth to capture some runaway time, and actually begin my real posting. Edit: Oh, dear, I feel funny editing my first ever post. What a dear little thing you are, quaint little post written in semi-Old English.